There are few birds as majestic as the hawk and the eagle. As raptors, these birds of prey rule the sky with a regal beauty. The American bald eagle is the symbol of our nation (in contrast to Benjamin Franklin’s choice of the turkey). It is impressive to watch these birds fly. They have a grace about them and yet fierceness for their uncanny ability to see with such precision. The Lord uses them as an example to Job of the majesty of His creation and power of His word. Job and his friends had long discussed the mercies of God seeking answers for the misery fallen upon poor Job. As they digressed further from the true nature of suffering and God, Elihu speaks up rebuking the four older men for their misguided views of the power of the Lord. It was then God Himself intervenes from the whirlwind challenging Job to consider the omnipotence of His power seen in creation. Near the end of His discourse, God reminds Job the hawk and the eagle are not controlled by man but by the will of the Lord alone. 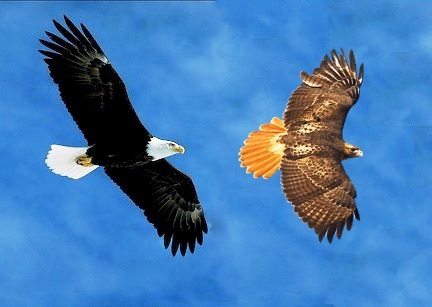 The hawk and the eagle are majestic birds that carry out their lives without any regard to the will of man. God has placed within the hawk the power of flight. He created the hawk. It is according to the will of the Lord the eagle soars above the earth making its nest on high. The eyesight of these birds can be four times that of a person with perfect vision. A rabbit can be spotted from a mile away making the hawk and the eagle one of the premier hunting animals on earth. All of this comes about because of the creation of God. Job is reminded of how great the Lord is and how lowly man must remember he is. There are great lessons for us to consider when we spend time watching nature. Birds gather to their nest their needs with no worries or concerns. Animals scurry around preparing for winter. Bears will hibernate, flocks of geese will fly to warmer climates and thousands of animals will migrate to their feeding pastures. The cycle of life within the kingdom of nature has continued since the beginning of time without interruption. How is this all possible and who made it so? The Lord God Creator is the one who reveals His character through the animal kingdom. Ants have no leader yet they work tirelessly. Bees harvest the elements of their honey world with precision. Fish fill an abundant world with bounty unending and the creatures of the earth supply man with food and clothing. All of this made possible by the hand of God. The Lord has left His imprint upon the face of the earth with creatures like the hawk and the eagle. They show His handiwork in everything they do. Man can marvel at their beauty but he should be reminded the hawk and the eagle fly because of the will of the Lord, not man. The hawk and eagle teach men. Take time out of your busy day and look at the world around you. It will amaze you how much you will see what you have not seen before. Praise God for His magnificent creation.